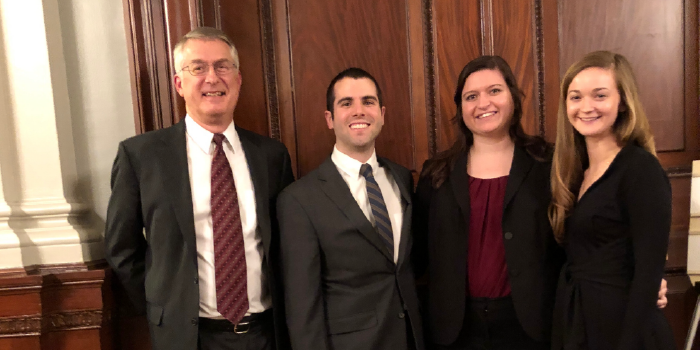 The Wake Forest School of Law National Moot Court Team of Emily Lagan (JD ’18), Kelsey Mellan (JD ’18) and Alex Teixeira (JD ’18) furthered Wake Forest’s tradition of excellence and professionalism at the national finals held by the New York City Bar on Jan. 29 – Feb. 1, 2018. The team’s brief earned the eighth best score out of the top 28 teams in the country. Among the 160-plus teams that entered the competition, Wake Forest was one of 16 teams to advance to the quarterfinals. Leading up to the event, the team had placed second in its region in November, where it tied for the second best brief and Teixeira won the best oral advocate award. At the national finals, the team ran into some bad luck in the first round, but persevered with grace and class. In the second round, Teixeira and Mellan had an outstanding argument against Minnesota, which had the ninth best brief. “They would have beaten any moot court team anywhere, anytime,” said Professor John Korzen (JD ’91). Based on cumulative scores over the first two rounds, Wake Forest advanced to the elimination rounds as the 14th seed. The team was paired against the third seed, Washington, which had the second best brief score and was determined the winner of the round. The team’s fine performance and professionalism reflected well on Wake Forest School of Law and continued the school’s success in the National Moot Court Competition, which is now in its 68th year.